DemoCurmudgeon: Dumb Ron Johnson shreds career bellowing Right Wing Media Conspiracy Theories!!! Dumb Ron Johnson shreds career bellowing Right Wing Media Conspiracy Theories!!! The fantasy was that Medicaid expansion is to blame for the opioid crisis in the United States. The ringmaster was Sen. Ron Johnson (R-Wis.). Johnson has been flogging this notion for the better part of a year, or longer, despite the utter lack of evidence that it’s true — and plenty of evidence that the opposite is true. So wouldn't countries with universal health care for everyone have an even bigger problem? The fact that prescriptions for opioids are down I guess wasn't important. Johnson wasn't done yet destroying the credibility of Homeland Security as their chairman. When they hacked Democratic emails, Russians were counting on a gullible mainstream news media and an unprincipled right-wing echo chamber to transform a bunch of trivial internal communications into a pseudo-scandal by wrenching them from all context. 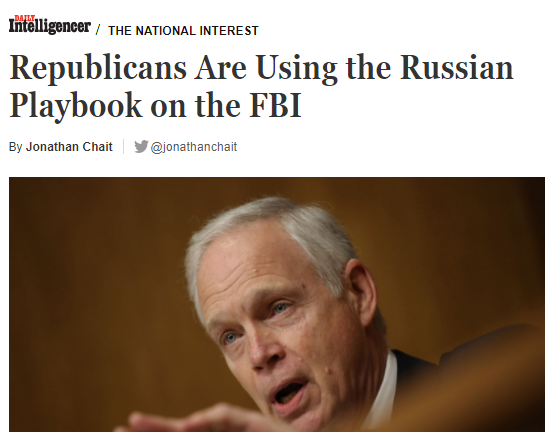 It is ironic that the current Republican effort to dismiss the very real scandal that arose from those hacks is using the exact same method. 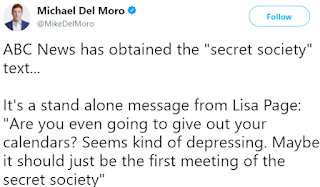 "Secret Society" or Frighteningly Gullible Chairman of Homeland Security Ranting Hysterically? Are you kidding? It's a stunning national transformation. What's happened to my conservative Trumpian friend in Milwaukee is now happening to every Republican; they're all spewing scattershot ramblings of disconnected conspiracy's leading to a "secret society" that meets "off-site" for the purpose of bringing down Trump. Seriously? And the drooling right-wing masses think we're still angry losers, just like they would be if Hillary had won..it's what we call projection. 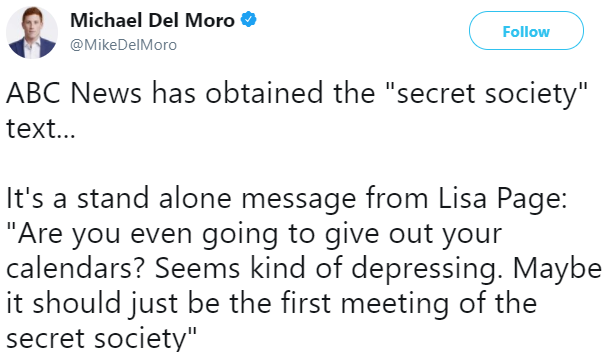 Out-of-Context Johnson BS: This tweet explains one major piece of Johnson's hyperbolic baloney pulled out of context, that "Secret Society:"
1. The first wave of stories revealed that Strzok and Page had criticized Donald Trump and referred to their investigation as an “insurance policy.” It sounded extremely suspicious. In fact, a reporter who reviewed the entire context explained that they were referring to an FBI policy favorable to Trump. Strzok used the insurance metaphor — “It’s like an insurance policy in the unlikely event you die before you’re 40” — to describe the folly of treating an unlikely event as though it had no chance of happening. 2. Strzok and Page had advance knowledge of a Wall Street Journal story. In fact, as Ryan Reilly and Nick Baumann later explained, the story in question was harmful to Clinton, and elsewhere they expressed concern about unauthorized leaks. 3. Strzok expressed reluctance to join Robert Mueller’s team, because “my gut sense and concern is there’s no big there there.” Johnson told a conservative talk-show host that this “jaw-dropping” comment amounted to a confession that Strzok knew that Trump was innocent and joined Mueller’s investigation to smear him. But maybe Strzok simply had an open mind and thought Mueller’s probe stood a strong chance of clearing Trump.